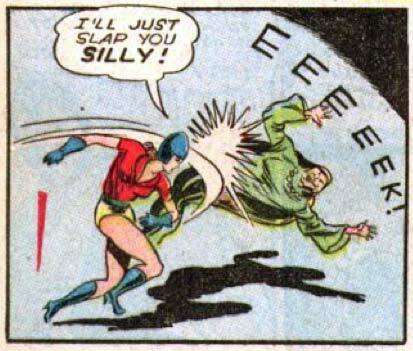 Bulletgirl was too busy slapping the villain silly to notice the ninja tank sneaking up behind her! Watch out Bulletgirl! What is WRONG with this woman?!? Yeah. Yeah. But is that like some kinda psi-power she’s got? I mean , the big baddie just squeeeked like a leeetle girl, right? Better than a “stern talkin’ to”. Yah, we could use the new companion vehicles to put a ninja tank sneeking up on her! Holy crap, I just spelled “sneaking” wrong! @William. Thanks for the heads up. I will refrain from posting my version. “Silly is as silly does”. Gumps momma.